Why is network performance so important? An important initial goal when setting up monitoring is to provide your network with a level of uptime that is as close to 100% as possible. But even perfect availability does little good if your network suffers from poor performance. Performance problems such as low bandwidth, overloaded servers, or sluggish virtual machines can not only frustrate company employees, but also interrupt business processes and lead to losses in sales. With a high-performance network, the whole company will work with maximum efficiency. 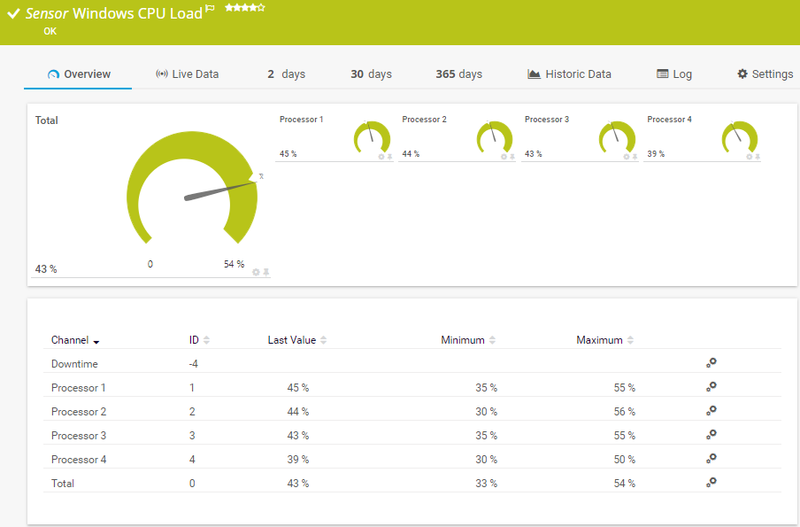 The PRTG Performance Monitoring Tool allows you to prevent performance bottlenecks, and ensure all computers, server and programs run as smoothly as possible. PRTG provides you with a constant overview of the performance levels of each and every component in your network. This overview is particularly helpful when it comes time to organize your IT infrastructure. It will allow you, for example, to expand your server room in such a way that saves your company money. You may also discover potential savings in individual network components. Performance plays a major role in the various layers of an IT infrastructure. Monitoring network components, applications, and services manually has little to no effect at all – especially if your network has already expanded beyond a manageable size. 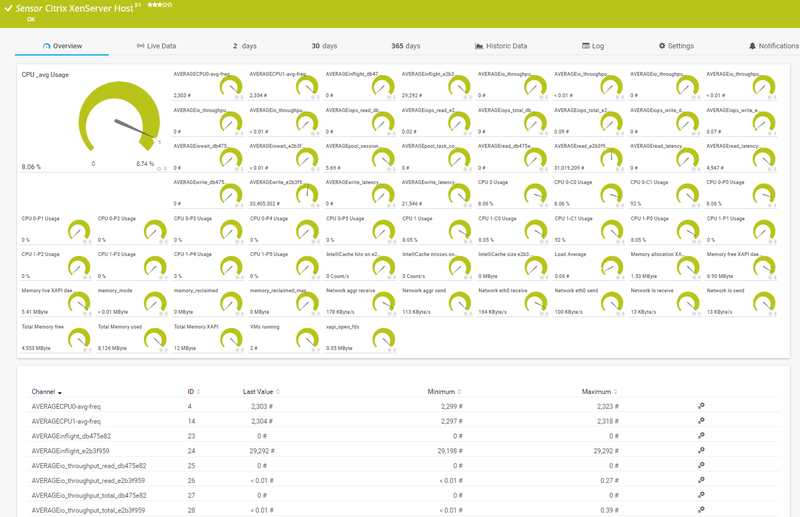 PRTG collects all the performance data of your network, and displays it on easy-to-read dashboards. You can personalize the look and feel of your monitoring data, and use the PRTG custom maps to create your own individual dashboards. 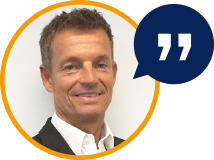 Bandwidth is a vital factor when it comes to measuring network performance. 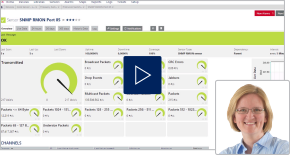 PRTG displays performance metrics such as download and upload speeds in real time. The tool also records the speed of local connections. Data traffic can be read directly on your router to provide you with a quick and simple overview of your bandwidth consumption, and the corresponding volume of data that has been transmitted. Low bandwidth is a typical cause of network disruptions. For problems such as sluggish applications, interruptions during automatic backups and slow data transmissions, the culprit is often insufficient bandwidth. 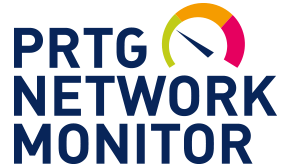 PRTG monitors bandwidth and keeps you constantly informed of the goings-on of your network. You’ll see exactly how much bandwidth your services and devices are using, and how this usage evolves over time. As a result, you can quickly get to the root of problems, eliminate bandwidth hogs, or perform required upgrades to your network. Learn more about bandwidth management here. At many companies, virtualization is an important part of the IT infrastructure. Virtualization allows for both the effective use of resources and the flexible distribution of capacities, all the while reducing the need for network maintenance. These benefits, however, can only be enjoyed if all the virtualized elements perform at a peak level. PRTG monitors the performance of your virtualized infrastructure on many different levels. Its neatly-arranged dashboards display all you need to know about your hosts and virtual machines, and the operating systems and applications running on them. Countless applications run on the computers and servers of any IT environment. These applications must operate at an uncompromisingly high level of performance, especially if they are used for business-critical purposes. Manual monitoring is not recommended, for you can quickly lose sight of the values you need most. PRTG automatically monitors the network performance of all your processes and applications, and presents data on a centralized, easy-to-read dashboard. You will see at a glance which applications are using which resources, and how your traffic is dispersed. PRTG promptly informs you before capacity-related problems can arise, allowing you to intervene swiftly and prevent your network from crashing. As your company grows, your processors will be put under greater strain due to the increasing number of users accessing the applications, files, and other contents on your servers. Programs and services slow down, and overall network performance suffers. Thanks to PRTG, you can spot bottlenecks at once, and immediately see if your servers are on the brink of overloading. PRTG alerts you before your servers become overstrained and your colleagues are unable to continue working. You’ll be able to determine which parts of your server room need upgrading, and where you can save on resources. With its performance counters Microsoft Windows has created a service that measure the performance of software applications. The Windows-specific Performance Monitor (perfmon.exe) presents performance counter data as graphs, but does not allow users to customize data or arrange data in an easy-to-read fashion. The Windows Performance Monitor, moreover, does not include an alarm feature. PRTG fills these gaps by letting you read all the performance counters of your Windows-systems, and by displaying the corresponding data on a neatly-arranged dashboard. You’ll see the evolution of performance values, and can quickly determine where bottlenecks lie (and what has caused them). You’re free to set limits for individual counters, and will immediately be notified in the event these thresholds are exceeded. PRTG also creates automated reports for past time periods, which is the perfect way to keep your coworkers or managers abreast of the performance of your network. As performance problems can lead to disruptions in the day-to-day operations of your company, it is crucial that you take action at once. Thanks to the PRTG alarm system, you’ll immediately be notified in the event of bottlenecks or drops in performance. Most of the time, you’ll be able to fix the problem before your coworkers or customers have time to notice something is wrong, which means your boss will likely thank you for it! Each sensor can be customized with your own personal threshold value. If this value is exceeded, you'll immediately receive an alarm – by your choice of email, SMS, or push notification. 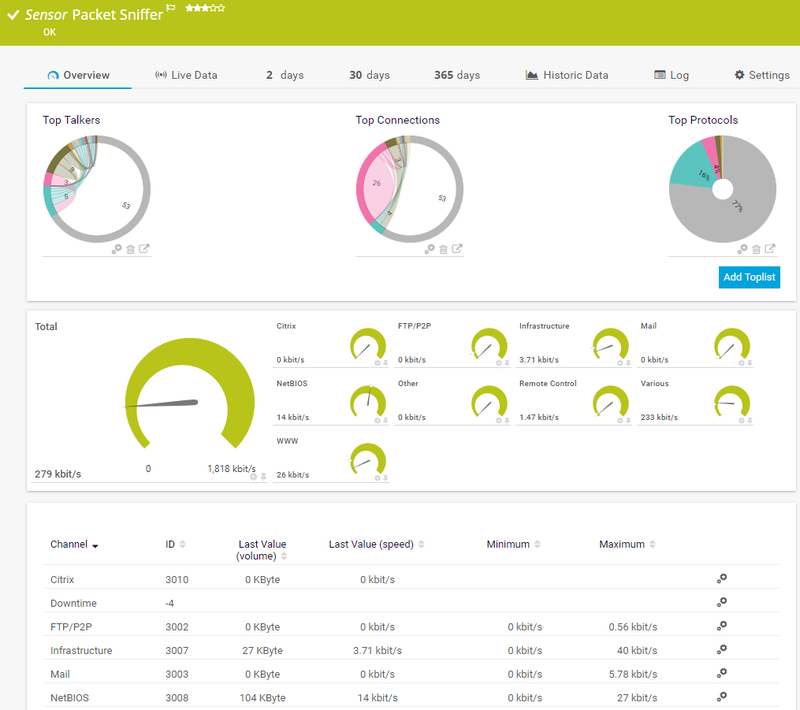 Use PRTG to monitor and analyze your network performance over longer periods of time. 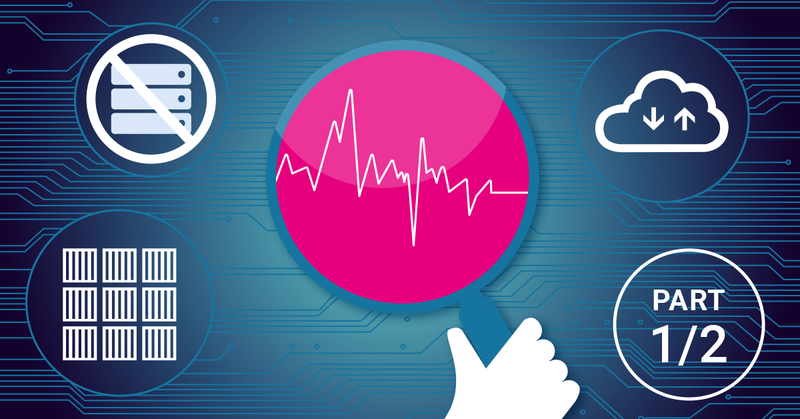 Long-term monitoring helps you get to the root of problems which arise at certain times of the day or month, thus allowing you to improve the performance of your network! Use this sensor to monitor the host server of your Citrix-virtualization. By doing so, you’ll keep a constant eye on performance metrics such as CPU load, memory capacity, and network utilization. The Packet Sniffer Sensor analyzes the headers of all the data packets in your network and determines the amount of traffic that is generated by individual services. Find out more about packet sniffing here. The Windows CPU Load Sensor uses WMI or Windows performance counters to measure the CPU load of a computer. You can also write your own sensors and incorporate them into PRTG. In this video, we’ll show you how PRTG uses SNMP and WMI to help you keep a constant eye on your bandwidth. The PRTG Ping Sensor is perfect for measuring network performance. This sensor monitors the availability of all your network devices. During setup, a range of IP addresses is pinged, and basic initial monitoring is configured. If the ping fails, you’ll be notified at once. Company workstations are usually connected to the network via Ethernet, as Ethernet cables are more stable than Wi-Fi. As a result, many administrators wonder if and how they can monitor and test the performance of their LANs. A special ethernet testing software is available. PRTG is a network monitoring tool that also monitors local networks – in particular, distributed networks. Want to learn more? Please do! PRTG uses WMI, performance counters, and SNMP for Windows monitoring. Windows Event Log monitoring and Windows security monitoring are also available. PRTG offers comprehensive database monitoring. With PRTG, you can monitor all your SQL software. PRTG monitors website availability, load times, and processes – from locations all over the world. Whether you’re dealing with a database server, mail server, or web server…as an administrator, it’s your job to make sure the network runs smoothly. With PRTG, you’ll keep a constant eye on all your servers – and be promptly notified in the event of malfunctions. PRTG analyzes data packets and displays the data packet loss rate. In the event a critical value is exceeded, you’ll automatically receive an alert. PRTG offers you an overview of traffic distribution between international DN nodes, as well as information on traffic strength, response times, and potential weak spots. 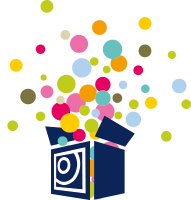 PRTG keeps a constant eye on your networks, devices, systems, and applications. This helps you get started with network management.